Would you put your company’s mission critical data in the cloud? In the personal tech world, the buzz is all about Apple and their i product assortment. 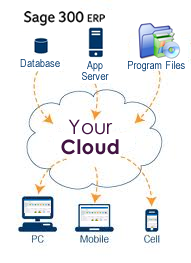 In the business world, especially within IT and data management, the buzz seems to be loudest about the “cloud”. For an excellent explanation of what the cloud is, I point you to the Wikipedia entry http://en.wikipedia.org/wiki/Cloud_computing. This is an excellent primer on what it is and how it works. Inherent to the information within Wikipedia is the perceived conundrum that lies within, especially when decision makers begin the discussion about moving the sensitive data that lies within Enterprise systems such as the one we implement, service and support, Sage 300 ERP or Accpac as lots of folks still know it. In a nutshell, trepidation is due to the fact that companies perceive that they are entrusting their data and software to a remote service. These concerns are quite valid. Even with folks who are technologically savvy and more apt to consider a cloud solution, their questions revolve around data ownership and security, where the data actually sits and what happens if the cloud provider shuts the doors or just closes off access to extremely sensitive data for any reason. Of course there are huge cost benefits to going with the cloud, especially in the case of data and software that require a significant hardware load and perhaps some expensive IT folks, just to name a few of the cost concerns. The trick really is to find a provider you trust and are comfortable working with.